After watching PBS’s Frontline program “Being Mortal” with Dr. Atul Gawande, I knew I wanted to read this book with the same name. It didn’t disappoint. Having intimately walked through aging and the end of life with both of my parents up close and personally, I could nod my head at much of what Dr. Gawande said about life and medicine as it exists today and how it should be instead. Surprisingly, I found some comfort in knowing that my parents and I – although many times it seemed like a David and Goliath battle – together took the right and the best approach toward both. Everybody should read this book. It highlights one of my mantras about living: quantity doesn’t equal quality and in the end, if there’s no quality, there’s no life. We Americans especially are on this eternal quest to cheat aging (and spend who knows how much money on one gimmick after another to try to sidestep it or avoid it altogether), so we ignore the inevitable fact that this body is temporary and it starts failing us gradually and slowly from the day we are born. And because we ignore the aging process, we do not plan and are not prepared – nor, for the most part, is society – for the changes that need to be made, while preserving independence, vitality, and purpose, when we reach the point of physical breakdown where we need help. We Americans also have been so removed from the process of dying that we literally treat death as an abnormality instead of the expected and intended end of all humans. Medicine has accommodated this and public policy and insurance companies have thrown their support behind this quest for “a little more time.” What buying a little more time has cost us is a lot of money, more harm than good (the cure is often far worse than the disease), and the loss of quality of life. 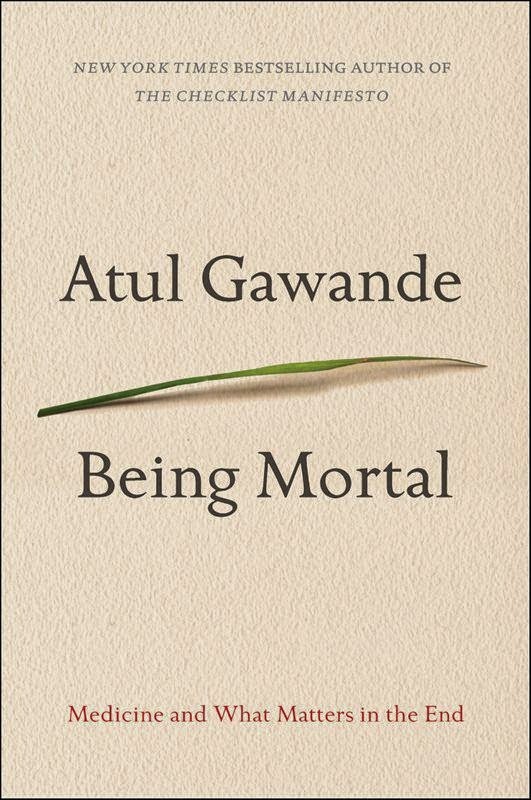 Dr. Gawande refocuses aging and end of life through a difference lens. He poses the questions most people, including medical professionals, don’t want to ask, but should ask. And we should answer. Some of us will die suddenly – the reality is that no death is unexpected, because that’s the end game for all of us. Even if we die suddenly though, there are many things we need to have in place to make our deaths as easy on whoever will be taking care of our affairs afterwards as possible. If we die suddenly then we may be too young to have to plan for aging well. But many of us will live long enough to come face to face with the aging process. Without a plan, all bets are off. If we want control over how our lives go when we age to the point where we need help and we want control over how our final years, months, weeks, days on this earth unfold in terms of what’s most important to us (family, friends, faith, being at home, etc. ), then today is the day to start thinking about it, plan for it, and make our decisions known to everyone who needs to know.